If you received a traffic ticket in Charlotte, North Carolina or were cited for speeding or reckless driving in Mooresville or Gastonia, try not to worry. It's actually a pretty common occurrence. There are reasons for that. . .and they are I-77, I-85, and I-40 in North Carolina. "Charlotte-Mecklenburg, Iredell, and Gaston County NC are shipping and trucking centers. They sit smack-dab at the intersection of three of the busiest interstate highways in the Southeast. We have crazy-heavy traffic and congestion on our roadways." With heavy traffic come accidents related to speeding violations and other North Carolina motor vehicle offenses like following too closely, lane violations, and stop sign / red light tickets. And when there are accidents, law enforcement in the area take note. The Charlotte-Mecklenburg Police Department, Gaston County Sheriff's Department, Iredell County Sheriff's Department, together with the North Carolina State Highway Patrol (NC SHP), devote a tremendous amount of resources to traffic laws enforcement. That is also true at each of the district attorneys' offices and prosecutors in their respective judicial districts and criminal courts in North Carolina. What happens if you ignore or "forget to handle" a traffic ticket in North Carolina? North Carolina traffic laws control traffic within the state's borders. Though some may think that, since they are not residents of North Carolina, they can get away with traffic violations within the state. North Carolina is part of a coalition known as the Non-Resident Violator Compact (NRVC), where information regarding traffic tickets (what NC traffic lawyers refer to as a Uniform Citation) is shared between states. Many states give what is called, "Full Faith and Credit" for things like speeding tickets, reckless driving citations, and more serious criminal charges like DUI DWI Impaired Driving. "In order to drive in or through North Carolina, you must possess a valid driver's license or operator's license from your home state. If your license is suspended or operator's permit is revoked in your own state of residence, you are presumed suspended in NC too." Failure to Appear (FTA) for a traffic ticket in a North Carolina courtroom can result in an administrative suspension by the North Carolina Department of Transportation / Division of Motor Vehicles (DMV). Notice of the suspension will be transmitted by NC DMV to your home state. That may, in many instances, result in an additional suspension where you live. "That's just the start of your legal problems. Judges and prosecutors in North Carolina don't take a shine to people ignoring tickets. In certain instances, normally for more serious criminal charges, 'criminal process' may be issued for failing to appear in court. That may or may not involve an Order for Arrest (OFA)." Can you fight a NC traffic ticket if you live outside North Carolina? "Fight" is a strong word. Most people in the general public who face traffic tickets or criminal charges in North Carolina, when they say that, really are asking if there are ways to avoid a conviction for speeding, careless driving, or some other traffic ticket. Just like each person is different, with different backgrounds and experiences, each traffic ticket in NC is different. Our law firm and NC traffic lawyers carefully review the background materials of each ticket we handle. That includes getting a copy of the uniform citation and pulling a record check or DMV check when able. "As defense lawyers with substantial experience handling traffic tickets in North Carolina, we know how important it is to approach legal representation, and clients' individual needs, with care and consideration. It doesn't matter if they are felony or misdemeanor charges - that is a fundamental protocol at our law firm." If you were pulled over by Charlotte police or a state patrol officer and issued a ticket, you may not agree with the citations. You may be tempted to ignore the ticket and never pay the fine, court costs, or fees. While understandable, that's a bad idea. At the same time, there may be legal options available. Obviously, a lot depends on the nature and circumstances of the traffic ticket or criminal allegations. Indeed, some traffic tickets in North Carolina are deemed, "Non-waivable offenses" under the NC traffic laws; but, that doesn't mean a defense lawyer cannot help. "The vast number of tickets we handle on an annual basis are done so through a waiver of appearance. While a court date may have been assigned (as listed on the UNIFORM CITATION) our law firm regularly negotiates traffic tickets by waiver in Mecklenburg, Union, and Iredell County, North Carolina." For some violations, a court appearance may be required. Certain traffic violations in NC, such as hit and run, reckless driving, careless driving, no proof of insurance, speed competitions (drag racing), driving while impaired, and failure to heed blue light or siren, tend to be more serious. Challenging those matters in North Carolina may require a court appearance by you, and a trial, if legally appropriate. By hiring our law firm for legal representation, out-of-state residents with traffic tickets in North Carolina may be able to avoid returning to North Carolina. The defense attorneys (traffic lawyers) at Powers Law Firm PA stand ready to help you. It makes sense to call us now. 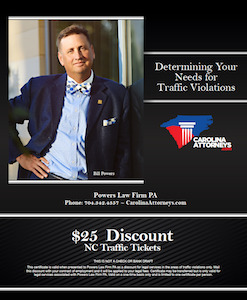 The North Carolina traffic ticket lawyers working for Powers Law Firm law firm are experienced legal professionals. Fees for legal services are normally set on a fixed, flat rate. Our consultations for criminal charges and traffic tickets in North Carolina are always free and confidential, and can be done over the phone. If you received a North Carolina traffic violation but you are not a resident of the Tar Heel State, we can help you and make the whole process much easier. We regularly provide legal representation for out-of-towners who received traffic tickets in Mecklenburg County, Union County NC, Iredell County, Gaston County, and Rowan County, North Carolina.